The question of how chromatin regulators and chromatin states affect the genome in vivo is key to our understanding of how early cell fate decisions are made in the developing embryo. ChIP-Seq—the most popular approach to investigate chromatin features at a global level—is outlined here for Xenopus embryos. Gentsch, G. E., Patrushev, I., Smith, J. C. Genome-wide Snapshot of Chromatin Regulators and States in Xenopus Embryos by ChIP-Seq. J. Vis. Exp. (96), e52535, doi:10.3791/52535 (2015). The recruitment of chromatin regulators and the assignment of chromatin states to specific genomic loci are pivotal to cell fate decisions and tissue and organ formation during development. Determining the locations and levels of such chromatin features in vivo will provide valuable information about the spatio-temporal regulation of genomic elements, and will support aspirations to mimic embryonic tissue development in vitro. The most commonly used method for genome-wide and high-resolution profiling is chromatin immunoprecipitation followed by next-generation sequencing (ChIP-Seq). This protocol outlines how yolk-rich embryos such as those of the frog Xenopus can be processed for ChIP-Seq experiments, and it offers simple command lines for post-sequencing analysis. Because of the high efficiency with which the protocol extracts nuclei from formaldehyde-fixed tissue, the method allows easy upscaling to obtain enough ChIP material for genome-wide profiling. Our protocol has been used successfully to map various DNA-binding proteins such as transcription factors, signaling mediators, components of the transcription machinery, chromatin modifiers and post-translational histone modifications, and for this to be done at various stages of embryogenesis. Lastly, this protocol should be widely applicable to other model and non-model organisms as more and more genome assemblies become available. The first attempts to characterize protein-DNA interactions in vivo were reported about 30 years ago in an effort to understand RNA polymerase-mediated gene transcription in bacteria and in the fruit fly1,2. Since then, the use of immunoprecipitation to enrich distinct chromatin features (ChIP) has been widely adopted to capture binding events and chromatin states with high efficiency3. Subsequently, with the emergence of powerful microarray technologies, this method led to the characterization of genome-wide chromatin landscapes4. More recently, chromatin profiling has become even more comprehensive and high-resolution, because millions of co-immunoprecipitated DNA templates can now be sequenced in parallel and mapped to the genome (ChIP-Seq)5. As increasing numbers of genome assemblies are available, ChIP-Seq is an attractive approach to learn more about the genome regulation that underlies biological processes. Here we provide a protocol to perform ChIP-Seq on yolk-rich embryos such as those of the frog Xenopus. Drafts of the genomes of both widely used Xenopus species—X. tropicalis and X. laevis—have now been released by the International Xenopus Genome Consortium6. The embryos of Xenopus species share many desirable features that facilitate and allow the interpretation of genome-wide chromatin studies, including the production of large numbers of high-quality embryos, the large size of the embryos themselves, and their external development. In addition, the embryos are amenable to classic and novel manipulations like cell lineage tracing, whole-mount in situ hybridisation, RNA overexpression, and TALEN/CRISPR-mediated knockout technology. The following protocol builds on the work of Lee et al., Blythe et al. and Gentsch et al.7-9. Briefly, Xenopus embryos are formaldehyde-fixed at the developmental stage of interest to covalently bind (cross-link) proteins to their associated genomic DNA. After nuclear extraction, cross-linked chromatin is fragmented to focus subsequent sequencing on specific genomic binding or modification sites, and to minimize the contributions of flanking DNA sequences. Subsequently, the chromatin fragments are immunoprecipitated with a ChIP-grade antibody to enrich those containing the protein of interest. The co-immunoprecipitated DNA is stripped from the protein and purified before creating an indexed (paired-end) library for next-generation sequencing (NGS). At the end, simple command lines are offered for the post-sequencing analysis of ChIP-Seq data. NOTE: All Xenopus work complies fully with the UK Animals (Scientific Procedures) Act 1986 as implemented by the MRC National Institute for Medical Research. Estimate the number of embryos required for the ChIP experiment (see discussion). Prepare the following solutions which are stored at RT: 500 ml of 10x Marc’s Modified Ringers (MMR) without EDTA, pH adjusted to 7.5 and sterilized by autoclaving (1 M NaCl, 20 mM KCl, 20 mM CaCl2, 10 mM MgSO4, 50 mM HEPES pH 7.5)10, 1 ml of SDS elution buffer (50 mM Tris-HCl pH 8.0, 1 mM EDTA, 1% SDS) and 1 ml of 5x DNA loading buffer (0.2% Orange G, 30% glycerol, 60 mM EDTA pH 8.0). Prepare the following solutions which are stored at 4 °C: 50 ml of HEG buffer (50 mM HEPES–KOH pH 7.5, 1 mM EDTA pH 8.0, 20% glycerol), 500 ml of extraction buffers E1 (50 mM HEPES-KOH pH 7.5, 150 mM NaCl, 1 mM EDTA. 10% glycerol, 0.5% Igepal CA-630, 0.25% Triton X-100), E2 (10 mM Tris-HCl pH 8.0, 150 mM NaCl, 1 mM EDTA, 0.5 mM EGTA), and E3 (10 mM Tris-HCl pH 8.0, 150 mM NaCl, 1 mM EDTA, 1% Igepal CA-630, 0.25% Na-Deoxycholate, 0.1% SDS), 500 ml of RIPA buffer (50 mM HEPES-KOH pH 7.5, 500 mM LiCl, 1 mM EDTA, 1% Igepal CA-630, 0.7% Na-deoxycholate) and 50 ml of TEN buffer (10 mM Tris-HCl pH 8.0, 1 mM EDTA, 150 mM NaCl). Score and clip a 15 ml conical polystyrene tube at the 7 ml mark. Use this tube to contain nuclear extracts undergoing sonication. For post-sequencing analysis, use a multicore Unix-style operating computer with at least 8 GB RAM and 500 GB free disk space. Install the following software locally of which most are used at the command line: FastQC, Illumina CASAVA-1.8 quality filter, Bowtie11, SAMtools12, HOMER13, MACS214, IGV15,16, Cluster317, Java TreeView, BLAST+18, and b2g4pipe19. Check the installation instructions and requirements for compilers and third party software. Build a Bowtie index for aligning short NGS reads to the Xenopus genome. An example is shown here for the X. tropicalis genome v7.1 (November 2011), which can be downloaded as a FASTA file (genome.fa) from the Xenbase ftp server (/pub/Genomics/JGI). Move the FASTA file to the index subdirectory of Bowtie. Download the gene annotation file (GTF) from the UCSC Genome Browser or the mirror site on the NIMR server for latest genome versions (genomes.nimr.mrc.ac.uk) via Tools/Table Browser. Use the genome FASTA file and the GTF file to customize HOMER for Xenopus (e.g., X. tropicalis genome v7.1, -name xenTro7). Alternatively, use pre-built HOMER packages for some older versions of the Xenopus genome. Search for human (txid9606), mouse (txid10090), zebrafish (txid7955), fruit fly (txid7227) and yeast (txid4932) proteins from the NCBI site via its advanced search function (http://www.ncbi.nlm.nih.gov/protein/advanced) and send the resultant GI (sequence identifier) list (sequence.gi.txt) to the computer. Assign Xenopus genes to the most similar proteins from the GI list by executing BLASTx with a certain expect (E) value cutoff (here 10-20). Make sure the output format is xml (-outfmt 5 -out blastx_results.xml). Make use of time-saving threads (-num_threads) which correlate with the number of available computer cores. Open the b2gPipe.properties file of the b2g4pipe folder with a text editor and update the database properties to Dbacces.dbname=b2go_sep13 and Dbacces.dbhost=publicdb.blast2go.com. Run b2g4pipe from the installation folder. NOTE: This program extracts GO terms for each BLAST hit and assigns them to corresponding Xenopus genes (xenTro7.annot). The most updated database settings can be found under Tools/General Settings/DataAccess Settings of the Blast2GO Java Web Start application (see 9.11.1). Fertilize Xenopus eggs, de-jelly and culture embryos according to standard protocols20. Transfer the dejellied embryos (maximum 2,500 X. laevis or 10,000 X. tropicalis) at the developmental stage of interest to an 8 ml glass sample vial with cap and wash them briefly once with 0.01x MMR. Fix the embryos with 1% formaldehyde in 0.01x MMR (e.g., add 225 µl of 36.5-38% formaldehyde to 8 ml 0.01x MMR) for 15 to 40 min at RT (see Discussion for the fixation time and the number of embryos required per ChIP experiment). NOTE: Formaldehyde is corrosive and highly toxic. It is hazardous in case of eye and skin contact, indigestion, and inhalation. Use the fume hood when adding formaldehyde to the vial. Stop the fixation by briefly washing the embryos three times with cold 0.01x MMR. Do not let embryos make contact with the liquid surface because surface tension causes them to rupture. Aliquot the embryos into 2 ml microcentrifuge tubes on ice with a maximum of 250 embryos per tube, which occupy a volume of approximately 250 µl (X. tropicalis) or 600 µl (X. laevis) before hatching. Pipette away as much 0.01x MMR as possible. Skip the following step if you continue immediately with section 3. Equilibrate embryos in 250 µl of cold HEG buffer. Once the embryos have settled to the bottom of the tube remove as much liquid as possible and snap-freeze in liquid nitrogen. Store at -80 °C. NOTE: The following extraction of cross-linked chromatin from Xenopus embryos works most efficiently with the fixation times indicated in step 2.3 and 50 to 80 X. tropicalis or 25 to 40 X. laevis embryos per ml of extraction buffer E1, E2 and E3. Each extraction step is repeated, so that twice the calculated volume of buffer is required. For upscaling, use multiple 2 ml microcentrifuge tubes or 50 ml centrifuge tubes. Keep samples and buffers on ice during the chromatin extraction. Supplement adequate volumes of buffers E1, E2 and E3 with 1 mM DTT and protease inhibitor tablets. If performing ChIP with a phospho-specific antibody, further supplement buffers with 5 mM NaF and 2 mM Na3VO4. Homogenize fixed embryos with E1 by pipetting up and down. Centrifuge homogenates in a refrigerated centrifuge (4 °C) at 1,000 x g for 2 min (or 5 min in case of using 50 ml tubes). Aspirate the supernatant and any lipids attached to the wall. Resuspend pellets in E1. Keep samples on ice for 10 min. Centrifuge and discard supernatants as in step 3.2. Resuspend pellets in E2. Centrifuge and discard supernatants as in step 3.2. Repeat step 3.4, but keep samples on ice for 10 min before centrifugation. Resuspend pellets in E3. Keep samples on ice for at least 10 min. Centrifuge and discard supernatants as in step 3.2. NOTE: At this stage, the resuspensions should become fairly transparent. The anionic detergents in E3 extract cross-linked nuclei by rendering most of the remaining yolk platelets soluble. Resuspend and pool pellets of cross-linked nuclei (normally colored brown from the insolubilized pigment granules) in a total volume of 1 ml of E3. Dilute sample with E3 to 2 or 3 ml if it appears very viscous and is difficult to pipette. Keep on ice or at 4 °C to proceed with step 4 on the same or following day. Snap-freeze in liquid nitrogen and store at −80 °C for later use. NOTE: Sonication is used both to solubilize and to shear cross-linked chromatin. Here are parameters to run the Misonix Sonicator 3000 equipped with a 1/16 inch tapered microtip and sound enclosure. If using other sonicators, follow the manufacturers’ recommendations to shear cross-linked chromatin or use 6 to 12 W for 4 to 8 min in total. Transfer the nuclear sample from step 3.7 into a custom-built tube for sonication (step 1.4). Keep the sample chilled during sonication by having the tube attached to an 800 ml plastic beaker filled with ice water via a short thermometer clamp. Place the beaker on a laboratory jack. Adjust the jack so that the sonicator microtip is submersed in the sample to about two-thirds of the volume depth and centered without touching the tube wall. Sonicate the sample for 7 min in total, interrupted every 30 sec with 1 min pauses. Set power to 1.0. Start the sonication and immediately increase the power setting (normally 2 to 4) to reach a reading of 9 to 12 W. Pause immediately if the sample begins to froth. Reposition tube and restart when the froth has completely disappeared. Transfer the sheared chromatin into pre-chilled 1.5 ml microcentrifuge tubes and spin at full speed (>15,000 x g) for 5 min at 4 °C. Transfer the supernatant to pre-chilled 1.5 ml microcentrifuge tubes. Collect 50 µl of the supernatant (ideally containing the chromatin of around 400,000 or more nuclei) to visualize the degree of chromatin fragmentation (section 5). Use the rest of the supernatant for ChIP (section 6). Store samples at 4 °C for up to one day. Snap-freeze samples as aliquots (one per ChIP experiment) in liquid nitrogen for long-term storage at -80 °C. Add 50 µl of SDS elution buffer, 4 µl of 5 M NaCl and 1 µl of proteinase K (20 μg/μl) to 50 µl of the supernatant from step 4.6. Incubate for 6 to 15 hr (O/N) in a hybridization oven set to 65 °C. Purify DNA using a commercial PCR purification kit. If necessary, use 3 M of sodium acetate (pH 5.2) to adjust pH as recommended by the manufacturer. Elute the DNA twice with 11 μl of elution buffer (10 mM Tris-HCl pH 8.5). Add 0.4 µl of RNase A (20 μg/μl) and 5 µl of 5x DNA loading buffer before running the entire sample alongside a 100 bp and a 1 kb DNA ladder on a 1.4% agarose gel by electrophoresis. For optimal results, stain gel with a safe nucleic acid staining solution after electrophoresis. NOTE: In this section, use low-retention 1.5 ml microcentrifuge tubes and at least 1 ml of indicated buffer per tube to wash magnetic beads for 5 min at 4 °C. Before removing the buffer from the beads, leave the tubes in the magnetic rack for 20 to 30 sec each time or until the solution is clear. Transfer 10 to 30 µl of the supernatant (sheared chromatin) from step 4.6 to a new tube to be used later as input sample, which corresponds to approximately 1% of total chromatin used for ChIP. Store at 4 °C until ChIP samples are ready for reversing cross-links. Transfer the remaining chromatin to a new tube. For ChIP-qPCR experiments requiring an antibody control, distribute equal volumes of chromatin to two tubes. Add the ChIP-grade antibody (or the corresponding antibody control) to chromatin. As a rough guide, use about 1 µg of antibody per one million cells expressing the epitope of interest. To more accurately estimate the amount of antibody required per ChIP experiment, run the same ChIP with various amounts of antibody (e.g., 0.25 µg, 1 µg and 2.5 µg) and compare the yield at negative and positive control loci by ChIP-qPCR (see section 10). As an antibody control, use normal serum of the same isotype and host animal species as the antibody. Incubate on a rotator (10 rpm) O/N at 4 °C. Wash an adequate amount of antibody-compatible magnetic beads once with E3 for 5 min at 4 °C. Check the manufacturer’s specification for the antibody binding capacity of the beads (usually 5 to 20 µl of beads bind 1 µg of IgG antibody). Add washed beads to the antibody pre-incubated chromatin. Further incubate on a rotator (10 rpm) for 4 hr. Wash beads four times (ChIP-qPCR) or ten times (ChIP-Seq) with pre-chilled RIPA buffer, and then once with pre-chilled TEN buffer. Only carry out this step if performing a ChIP-Seq experiment. Resuspend washed beads in 50 µl of TEN buffer per tube. Pool all beads from a single ChIP experiment by transferring them to one new tube. Use the magnetic rack and refrigerated (4 °C) centrifugation at 1,000 x g to collect beads at the bottom of the tube. Discard as much liquid as possible without disrupting the pellet of beads. Strip ChIP material off the beads by resuspending the beads in 50 to 100 µl of SDS elution buffer and vortexing them continuously with a thermomixer (1,000 rpm) for 15 min at 65 °C. After that centrifuge at full speed (>15,000 x g) for 30 sec. Transfer the supernatant (ChIP eluate) to a new tube. Repeat the last step and combine the ChIP eluates. Add enough SDS elution buffer to the input sample (step 6.1) to reach the volume of the ChIP sample, which is 100 to 200 µl (step 6.10). Supplement both ChIP and input samples with 1/20 volume of 5 M NaCl. Incubate the samples for 6 to 15 hr (O/N) at 65 °C in a hybridization oven. Add 1 volume of TE buffer and RNase A at 200 µg/ml. Incubate for 1 hr at 37 °C. Add proteinase K at 200 µg/ml. Incubate for 2 to 4 hr at 55 °C. Purify DNA by phenol:chloroform:isoamyl alcohol extraction followed by ethanol precipitation as previously outlined9. For ChIP-Seq, add 32 µl of elution buffer (10 mM Tris-HCl, pH 8.5) to dissolve the DNA pellet. Leave samples on ice for 30 min to ensure that the DNA is completely dissolved. NOTE: Commercial PCR purification kits have lower DNA recovery but are more convenient, and can be used for ChIP-qPCR samples. For ChIP-Seq, determine the concentration of 1 µl of ChIP and input DNA using fluorometry-based methods. Follow the manufacturer’s instructions and make sure that concentration of DNA falls within the reliable detection range of the fluorometer. NOTE: Current methods for DNA library preparation allow construction of high-complexity libraries for NGS from 1 to 2 ng. At the expense of some complexity, libraries can be made from as little as 50 pg of DNA (see Table of Specific Materials/Equipment). Use the same amount of DNA for both ChIP and input library. Briefly, to make indexed (paired-end) ChIP-Seq libraries, ChIP and input DNA need to be end-repaired, ligated to special adaptors (see Table of Specific Materials/Equipment), size-selected and PCR amplified. Follow the manufacturer’s guidelines to make ChIP-Seq libraries. See discussion for further recommendations. Elute each library in 12 µl of elution buffer and determine the concentration of 1 µl of each ChIP and input library using a fluorometer. Expect concentrations of 5 to 25 ng/µl. Consider reducing the number of PCR cycles (fewer than 18 cycles) if concentrations are higher than 25 ng/µl. NOTE: Accurate quantification is key to achieve optimal NGS results. Libraries with concentrations as low as 1 ng/µl after 18 PCR cycles can be sequenced, but frequently are of lower complexity. Use 1 µl of library to determine the fragment size distribution and to check for any adaptor dimer contamination (band around 120 bp) by chip-based capillary electrophoresis. Repeat the solid phase reversible immobilization purification with a beads-to-sample ratio of 1:1 (instead of 1.6:1) if the library contains adaptor dimers. Perform qPCR on validated positive and negative control loci (see section 10) to check whether similar DNA enrichment trends are observed before and after library preparation. Submit quality control approved libraries for sequencing. NOTE: Nowadays, NGS is often carried out by in-house or commercial sequencing facilities (see discussion for some NGS guidelines). The standard output are single or multiple gzip-compressed FASTQ files (*.fastq.gz) storing millions of sequencing reads. Normally, multiplexed reads are already separated according to their index and each read contains a sequence identifier and a quality control score (Phred+33 for Illumina 1.8+) for each base call. This approach here is only one out of many ways how to analyze NGS data. The reader is encouraged to check whether any of the following command lines require changes as this field is rapidly advancing and updates are occurring regularly. NOTE: Raw data from the successful sequencing of a high-complexity ChIP-Seq library should pass most tests. Failures originate mainly from poor sequencing runs and experimental artefacts such as biased PCR amplification or adaptor contamination. A certain degree of duplication (redundancy) is expected as redundant reads can represent bona fide DNA enrichment21. However, one can later restrict read tags - the 5’ end or reads - to one per base pair to eliminate any redundant reads without affecting the detection sensitivity of peaks (step 9.4)21. Pre-process sequencing data to remove adaptor contamination (homerTools trim -3 <adaptor sequence>) allowing one mismatch (-mis 1). Use the first 20 bases of the (indexed) adaptor (5’ to 3’) proximal to the DNA fragment of interest upon ligation (shown for adaptor listed in the Table of Specific Materials/Equipment). NOTE: The removal of filtered reads (-N) is only required by default in FASTQ files generated by Illumina 1.8. Omit the fastq_illumina_filter command (i.e., ‘| fastq_illumina_filter –vN’) if an older version than 1.8 generated the sequence identifier. NOTE: Bowtie expects Phred+33 quality scores by default. Include the option --phred64-quals if the FASTQ file was generated with Phred+64 quality scores by Illumina older than 1.8. NOTE: The transformation requires the scaffold index (genome.fa.fai) of the reference genome (step 1.8). Here the profile is limited to one tag per base pair (-tbp 1) and normalized to 10 million reads (-norm 1e7). bigWig is one of the preferred format to dynamically visualize chromatin profiles with a genome browser such as IGV (step 9.12). Find significant peaks of DNA enrichment between ChIP (-t ChIP.sam) and Input (-c Input.sam) in the X. tropicalis genome using MACS2 with a 1% FDR cutoff (-q 0.01) and DNA fragments (after sonication) of 200 bp (--bw=200) for model building. Add the flag --broad to this command line if expecting a broad distribution of the chromatin feature of interest such as histone marks or RNA polymerase. NOTE: The effective size of the X. tropicalis genome assembly v7.1 is about 1.4376 billion bp (-g 1.4376e9). MACS2 generates a BED file (ChIP_peaks.bed) enlisting peaks with their genomic locations. Use the graphical user interface of Cluster3 to upload ChIP.matrix file and hierarchically cluster these tag densities based on the minimal Euclidean distance to the closest centroid. Open the generated CTD file in Java TreeView to visualize the clustering. NOTE: The findMotifsGenome.pl script infers the enrichment from the comparison to randomly selected gene-centric background sequences. The most enriched novel motif is saved under motif1.motif in the format of a position weight matrix. The reader is encouraged to substantiate these results with other de novo motif discovery methods such as cisFinder22 and MEME23. Summarize the output using the following awk command to list the number (N), location and normalized read count of individual (R) and all (LR) peaks per nearest (target) gene. NOTE: The number after $ refers to the column number, which may need modifying to fit the ChIP_peaks.genes file created in the previous step. This script exemplar filters out peaks beyond 5 kb upstream and 1 kb downstream of the TSS. $7, $8 and $9 refer to the distance to the TSS, the gene identifier and the normalized read count per peak, respectively. Start the graphical user interface of Blast2GO from the command line via Java Web Start (javaws)19. Follow the developers’ instructions to upload the annotation file for Xenopus genes (xenTro7.annot) as generated in 1.9.4 and a flat file of identified target genes. Make sure that the same gene identifiers are used in both files. Visualize chromatin profiles by adding bigWig (ChIP.bw, Input.bw) and BED files (ChIP_peaks.bed) into IGV as tracks. Complement data with RNA-Seq tracks if available for the same stage of development. Save results as a session. Use programming platforms R (www.r-project.org) or MATLAB to further manipulate and visualize data as generated above. Alternatively, plot small datasets with Excel. Use the on-line platform Primer3 to design primers surrounding approximately 100 bp DNA at 60 °C (Tm) for both positive (peak-specific) and negative control loci. Confirm primer specificity using the in silico PCR search implemented into the UCSC Genome Browser. Create an 8-point standard curve of three-fold dilutions starting from approximately 1% input or use the 2−ΔΔC(T) method8,24 for the quantification of DNA enrichment. Execute real-time PCR in technical triplicates for all samples, i.e., ChIP, control and, if need be, standard curve samples. Plot DNA enrichment as the percentage of input DNA or as a ratio of ChIP versus control sample at both positive and negative control loci. Equivalent results to those presented here are expected if the protocol is well executed and the antibody in use is of ChIP-grade quality (see discussion). This protocol allows the extraction of nuclei from formaldehyde-fixed Xenopus embryos and the efficient shearing of chromatin by sonication (Figure 1A-C). Sheared chromatin shows an asymmetric distribution of DNA fragments mainly ranging from 100 to 1,000 bp and peaking between 300 and 500 bp (Figure 1C). A minimal 50 pg of immunoprecipitated DNA is required to successfully make an indexed paired-end ChIP-Seq library with similarly sized DNA inserts (Figure 2A). The library should be largely devoid of adaptor dimers, which can be seen on the electropherogram at approximately 120 bp. Upon sequencing-by-synthesis, pre-processed reads are mapped to the genome (Figure 2B, C). In a successful experiment with X. tropicalis embryos, normally 50 to 70% of single-end reads of 40 bp can be mapped uniquely to the genome assembly of v7.1 with maximally two mismatches. While input reads align quite uniformly across the genome, the alignment of ChIP reads results in strand-specific enrichments that flank the chromatin feature of interest. This is because all fragments are sequenced from the 5’ end (Figure 2C)25. Extending the alignment in reading direction to an average fragment size produces accurate profiles for single chromatin features such as transcription factor binding events. These DNA occupancies appear as peaks when visualized in IGV or any other compatible genome browser. Peak callers like MACS are used to determine the location of these peaks (Figure 3A). This way tens of thousands of binding sites have been determined in the X. tropicalis genome for T-box transcription factors such as VegT26. ChIP-qPCR experiments should confirm the local enrichment found by ChIP-Seq (Figure 3B). ChIP-Seq experiments allow exploring genome-wide characteristics of chromatin features. For example, calculating the read distribution over genomic elements such as transcription start and termination sites may highlight any spatial binding preferences around genes (Figure 3C). Similarly, a heatmap of read distributions at peak locations is used to compare different chromatin features at a genome-wide scale (Figure 3D). Certain transcription factors bind DNA sequence-specifically. De novo motif analysis of genomic DNA underlying peaks can retrieve this kind of information including co-enriched motifs of potential co-factors (Figure 3E). The great majority of target genes show DNA occupancy at a lower rather than higher level (Figure 3F). This scale-free feature seems to be quite common among transcription factors and suggests that only a small fraction of target genes are directly regulated with biological relevance27,28. 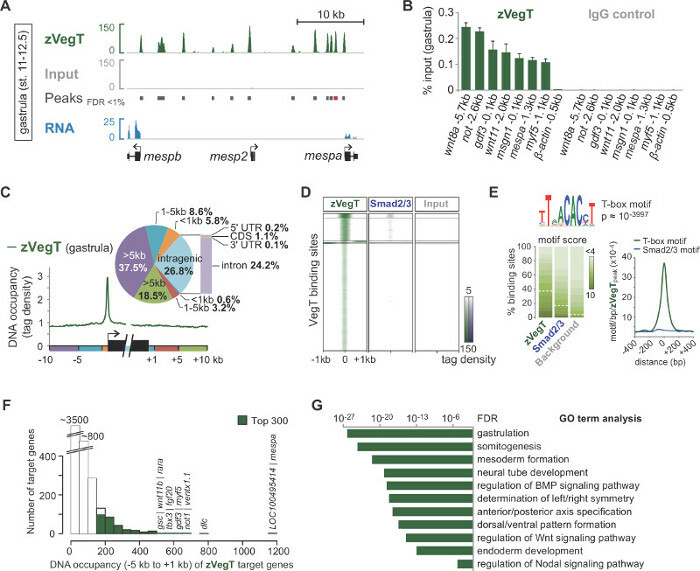 The analysis of enriched GO terms or other attributes such as the differential expression of target genes may further reveal insights into the biological function of the chromatin feature in the Xenopus embryo (Figure 3G). Figure 1. Chromatin immunoprecipitation procedure for Xenopus embryos. (A) Embryos are formaldehyde-fixed at the developmental stage of interest to covalently bind (cross-link) any proteins associated with genomic DNA. Upon nuclear extraction (B), cross-linked chromatin is fragmented to narrow down genomic DNA binding or chromatin modification sites by minimizing the flanking DNA sequence (C). Subsequently, the chromatin fragments are immunoprecipitated with a ChIP-grade antibody to enrich those containing the epitope of interest (D). The co-immunoprecipitated DNA is stripped off the protein and purified (E) before creating the ChIP fragment library for NGS (Figure 2). Please click here to view a larger version of this figure. Figure 2. ChIP-Seq library preparation, sequencing-by-synthesis, mapping and peak calling. (A) The electropherogram displays a good ChIP-Seq library with DNA templates of 250 to 450 bp. These templates entail the DNA insert of interest flanked by the universal (58 bp) and the indexed (63 bp) adaptor. (B) Millions of clusters, with each cluster containing identical templates, are sequenced base by base in the presence of all four nucleotides possessing reversible, distinct fluorophore and identical termination properties. Fluorescent images are processed in real time to call corresponding bases, which ultimately are assembled into reads. (C) Only reads that map uniquely to the Xenopus genome are kept. As all fragments are sequenced from the 5’ end, the mapping of ChIP reads results in strand-specific peaks that flank the chromatin feature of interest. Thereby, peak callers detect the enrichment that originates from immunoprecipitation and extend the reads to an average fragment length to accurately localize chromatin features. Please click here to view a larger version of this figure. Figure 3. An example of post-sequencing analysis and data visualisation by means of the zygotic T-box transcription factor VegT (zVegT). All read counts shown here are normalised to 10 million uniquely mapped and non-redundant reads. (A) Excerpt of the genome-wide profile of zVegT binding in X. tropicalis gastrula embryos (stage 11 to 12.5 after Nieuwkoop and Faber29). Each peak, a pile-up of extended reads, represents one binding site. These peaks are called by MACS2 with a false discovery rate (FDR) of less than 1%. Each mesp gene shows very proximal and upstream zVegT binding, but only mespa and mespb are expressed by that stage (RNA-Seq data30). (B) DNA occupancy levels of zVegT as determined by ChIP-qPCR at several loci (including a non-bound region 0.5 kb upstream of β-actin) confirm the specific enrichment found by ChIP-Seq. Compare results for mespa with peak called (red bar) in (A). The DNA occupancy level is visualized as a percentage of input for both, the ChIP with the VegT antibody (rabbit polyclonal of IgG isotype) and the ChIP with the antibody control (normal rabbit IgG). Error bars reflect the standard deviation of two biological replicates. (C) Metagene analysis shows preferential zVegT binding (tags binned over 25 bp) to the promoter relative to any other genomic region around and within gene bodies. (D) Heatmap shows k-mean clustered (k=5) DNA occupancy levels (tags binned over 25 bp) of zVegT and Smad2/Smad3 (ChIP-Seq data31) relative to all zVegT-bound regions at gastrula stage. The heatmap is log2 based and centred at 5 tags per bp. (E) De novo motif analysis discovers the canonical T-box transcription factor binding motif in 38% of zVegT-bound regions if the underlying motif score is normalised to a 5% discovery rate in background sequences. The density map shows highest enrichment for the T-box motif in the centre of zVegT binding sites, whereas the canonical Smad2/Smad3 binding motif is hardly enriched. (F) Histogram shows DNA occupancy levels of zVegT, which are calculated for each target gene from all peaks (+/- 200 bp) between 5 kb upstream [-] and 1 kb downstream [+] of corresponding transcription start sites. (G) Top 300 genes with highest DNA occupancy levels within -5 kb and +1 kb are enriched for biological processes of early embryonic development. These GO terms are in line with the putative function of zVegT. The FDR is based on a two-tailed Fisher’s exact test and corrected for multiple testing. Please click here to view a larger version of this figure. Our protocol outlines how to make and analyze genome-wide chromatin profiles from Xenopus embryos. It covers every step from cross-linking proteins to endogenous loci in vivo to processing millions of reads representing enriched genomic sites in silico. Since increasing numbers of genome drafts are available, this protocol should be applicable to other model and non-model organisms. The most important experimental section, which sets this protocol apart from previous work8,31,33,34, is the post-fixation procedure to extract cross-linked nuclei. It facilitates efficient chromatin solubilisation and shearing and easy upscaling. Together with improved efficiencies of library preparation this protocol allows the construction of high-complexity ChIP-Seq libraries from half to two million cells expressing the chromatin-associated epitope of interest. For ChIP-qPCR experiments, a few ten thousand of these cells are normally enough to check for DNA enrichment at perhaps six distinct genomic loci. These numbers are conservative estimates, but may vary depending on protein expression level, antibody quality, cross-linking efficiency, and epitope accessibility. As a guide, a single Xenopus embryo contains about 4,000 cells at the mid-blastula stage (8.5 after Nieuwkoop and Faber29), 40,000 cells at the late gastrula stage (12) and 100,000 cells at the early tailbud stage (20). The exact fixation time for efficient immunoprecipitation needs to be determined empirically by ChIP-qPCR (section 10). In general, longer fixation times are required if the experiment involves X. laevis embryos, early developmental stages, and weak (or indirect) DNA binding properties. However, it is not recommended fixing Xenopus embryos longer than 40 min, or processing more embryos than indicated (section 3), as chromatin shearing becomes less efficient. It is important not to use any glycine after fixation as this common step for quenching formaldehyde can make nuclear extraction from yolk-rich embryos very difficult. Currently, the reason for this is not known. It is conceivable that the formaldehyde-glycine adduct further reacts with N-terminal amino-groups or arginine residues35. The antibody is key to any ChIP experiment and sufficient controls need to be carried out to show its specificity for the epitope of interest (see guidelines by Landt et al.36). If no ChIP-grade antibody is available, the introduction of corresponding epitope-tagged fusion proteins may be a legitimate alternative as these proteins can occupy endogeneous binding sites37. In this case, uninjected embryos are best to use as a negative control rather than a ChIP with non-specific serum. This strategy may also be applied if the protein of interest is expressed at low levels resulting in the poor recovery of enriched DNA. As for making ChIP-Seq libraries, because of the low amount of DNA in use, it is recommended to opt for procedures that reduce the number of cleaning steps and to combine reactions to keep any loss of DNA at a minimum. The adaptors and primers need to be compatible with multiplex sequencing and the NGS platform (see Table of Specific Materials/Equipment). If using Y-adaptors (containing long single-stranded arms), it is critical to pre-amplify the library with three to five rounds of PCR before size-selecting DNA inserts (e.g., 100 to 300 bp) by gel electrophoresis. Single-stranded ends cause DNA fragments to migrate heterogeneously. Trial runs with various amounts of input DNA (e.g., 0.1, 0.5, 1, 2, 5, 10 and 20 ng) are recommended to determine the total number of PCR cycles (less than or equal to 18 cycles) required to make a size-selected library of 100 to 200 ng. Reducing the number of PCR cycles renders the sequencing of redundant reads less likely. Solid phase reversible immobilization beads are good cleaning up reagents to efficiently recover the DNA of interest and reliably remove any free adaptors and dimers from ligation and PCR reactions. In terms of number, type and length of reads, around 20 to 30 million single-end reads of 36 bp is enough for most ChIP-Seq experiments to cover the whole Xenopus genome with sufficient depth. The most prevalent NGS machines are routinely capable of meeting these criteria. However, it may be beneficial to increase the number of reads if a broad distributions of reads is expected, as observed with histone modifications, rather than sharp peaks. For many ChIP-Seq experiments, 4 to 5 differently indexed libraries can be pooled and sequenced in one flow cell lane using a high-performance NGS machine. Sometimes is also advisable to extend the read length and sequence both ends of the DNA template (paired-end) to increase mappability when analyzing chromatin within repetitive genomic regions. This protocol has been applied successfully to a wide variety of chromatin features such as transcription factors, signaling mediators and post-translational histone modifications. However, embryos acquire an increasing degree of cellular heterogeneity as they develop and chromatin profiles become harder to interpret. Promising steps have been made in Arabidopsis and Drosophila to tissue-specifically profile chromatin landscapes by extracting cell type-specific nuclei38,39. Our protocol includes a nuclear extraction step, which could pave the way for tissue-specific ChIP-Seq in other embryos. We thank Chris Benner for implementing the X. tropicalis genome (xenTro2, xenTro2r) into HOMER and the Gilchrist lab for discussions on post-sequencing analysis. I.P. assisted the GO term analysis. G.E.G and J.C.S. were supported by the Wellcome Trust and are now supported by the Medical Research Council (program number U117597140). 1/16 inch tapered microtip Qsonica 4417 This microtip is compatible with Sonicator 3000 from Misonix and Q500/700 from Qsonica. 8 ml glass sample vial with cap Wheaton 224884 8 ml clear glass sample vials for aqueous samples with 15-425 size phenolic rubber-lined screw caps. TCTGCTT*G. *, phosphorothioate bondphosphate group at 5' end. NNNNNN, index (see TruSeq ChIP Sample Preparation Guide for DNA sequence). Order adaptors HPLC purified. Adaptors can be prepared by combining equimolar amounts (each 100 µM) of the universal and the indexed adaptor and cooling them down slowly from 95 °C to room temperature. Use 1.5 pmol per ng of input DNA. Store at -20 °C. Chip for capillary electrophoresis Agilent Technologies 5067-1504 Load this chip with 1 µl DNA for library quality control. Store at 4 °C. Chip-based capillary electrophoresis system Agilent Technologies G2940CA The Agilent 2100 BioAnalyzer is used to check the quality of ChIP-Seq libraries. Keep reagents at 4 °C. ChIP-Seq library preparation kit (KAPA Hyper Prep Kit) Kapa Biosystems KK8504 Kit contains KAPA end repair and A-tailing enzyme mix, end Repair and A-tailing buffer, DNA ligase, ligation buffer, KAPA HiFi HotStart ReadyMix (2X), and KAPA library amplification primer mix (10X) (see also PCR primers). Adaptors are not included. Store at -20 °C. ChIP-Seq library preparation kit (alternative, ThruPLEX-FD Prep Kit) Rubicon Genomics R40048 Kit uses their own stem-loop adaptors and primers. This kit eliminates intermediate purification steps and is as sensitive as the KAPA Hyper Prep Kit. Store at -20 °C. Fluorometer reagents life technologies Q32851 The kit provides concentrated assay reagent, dilution buffer, and pre-diluted DNA standards for the Qubit fluorometer. Store DNA standards at 4 °C, buffer and dye at room temperature. Formaldehyde Sigma F8775-4X25ML Formaldehyde solution, for molecular biology, 36.5-38% in H2O, stabilised with 10-15% methanol. Store at room temperature. CAUTION: Formaldehyde is corrosive and highly toxic. Gel (E-Gel EX agarose , 2%) life technologies G4010 Pre-cast gel with 11 wells, openable format. Leave one lane between ladder and library empty to avoid cross-contamination. Store gels at room temperature. Gel electrophoresis system life technologies G6465 E-Gel iBase and E-Gel Safe Imager combo kit for size-selecting ChIP-Seq libraries. Gel extraction kit Qiagen 28706 Store all reagents at room temperature. Use 500 µl of QG buffer per 100 mg of 2% agarose gel slice to extract DNA. Use MinElute columns (from MinElute PCR purification kit) to elute DNA twice. Laboratory jack Edu-Lab CH0642 This jack is used to elevate sample in sound enclosure for sonication. Ladder, 100 bp New England BioLabs N3231 Keep 1x solution at room temperature. Store stock at -20 °C. Ladder, 1 kb New England BioLabs N3232 Keep 1x solution at room temperature. Store stock at -20 °C. Magnetic beads life technologies 11201D These Dynabeads are superparamagnetic beads with affinity purified polyclonal sheep anti-mouse IgG covalently bound to the bead surface. Store at 4 °C. Magnetic beads life technologies 11203D These Dynabeads are superparamagnetic beads with affinity purified polyclonal sheep anti-rabbit IgG covalently bound to the bead surface. Store at 4 °C. Magnetic beads life technologies 10001D These Dynabeads are superparamagnetic beads with recombinant protein A covalently bound to the bead surface. Store at 4 °C. Magnetic beads life technologies 10003D These Dynabeads are superparamagnetic beads with recombinant protein G covalently bound to the bead surface. Store at 4 °C. Na3VO4 New England BioLabs P0758 Sodium orthovanadate (100 mM) is a commonly used general inhibitor for protein phosphotyrosyl phosphatases. Store at -20 °C. NaF New England BioLabs P0759 Sodium fluoride (500 mM) is commonly used as general inhibitor of phosphoseryl and phosphothreonyl phosphatases. Store at -20 °C. Normal serum (antibody control) Santa Cruz Biotechnology sc-2028 Use as control for goat polyclonal IgG antibodies in ChIP-qPCR experiments. Store at 4 °C. Normal serum (antibody control) Santa Cruz Biotechnology sc-2025 Use as control for mouse polyclonal IgG antibodies in ChIP-qPCR experiments. Store at 4 °C. Normal serum (antibody control) Santa Cruz Biotechnology sc-2027 Use as control for rabbit polyclonal IgG antibodies in ChIP-qPCR experiments. Store at 4 °C. Nucleic acid staining solution iNtRON 21141 Use RedSafe nucleic acid staining solution at 1:50,000. Store at room temperature. Orange G Sigma O3756-25G 1-Phenylazo-2-naphthol-6,8-disulfonic acid disodium salt. Store at 4 °C. PCR primers e.g., IDT or Sigma Primers to enrich adaptor-ligated DNA fragments by PCR: AATGATACGGCGACCACCGA*G and CAAGCAGAAGACGGCATACGA*G, phosphorothioate bond. Primers designed by Ethan Ford. Combine primers at 5 µM each. Use 5 µl in a 50 µl PCR reaction. Store at -20 °C. MinElute PCR purification kit Qiagen 28006 for purification of ChIP-qPCR and shearing test samples. Store MinElute spin columns at 4 °C, all other buffers and collection tubes at room temperature. Phenol:chloroform:isoamyl alcohol (25:24:1, pH 7.9) life technologies AM9730 Phenol:Chloroform:IAA (25:24:1) is premixed and supplied at pH 6.6. Use provided Tris alkaline buffer to raise pH to 7.9. Store at 4 °C. CAUTION: phenol:chloroform:isoamyl alcohol is corrosive, highly toxic and combustible. Protease inhibitor tablets Roche 11836170001 cOmplete, Mini, EDTA-free. Use 1 tablet per 10 ml. Store at 4 °C. Protease inhibitor tablets Roche 11873580001 cOmplete, EDTA-free. Use 1 tablet per 50 ml. Store at 4 °C. Proteinase K life technologies AM2548 proteinase K solution (20 µg/µl). Store at -20 °C. RNase A life technologies 12091-039 RNase A (20 µg/µl). Store at room temperature. Solid phase reversible immobilisation beads Beckman Coulter A63882 The Agencourt AMPure XP beads are used to minimise adaptor dimer contamination in ChIP-Seq libraries. Store at 4 °C. Sonicator 3000 Misonix/Qsonica Newer models are now available. Q125, Q500 or Q700 are all suitable for shearing crosslinked chromatin. Sound enclosure Misonix/Qsonica optional: follow the manufacturer's recommendation to obtain the correct sound enclosure. Thermomixer eppendorf 22670000 Thermomixer for 24 x 1.5 mL tubes. Precise temperature control from 4 °C above room temperature to 99 °C. Gilmour, D. S., Lis, J. T. Detecting protein-DNA interactions in vivo: distribution of RNA polymerase on specific bacterial genes. Proc Natl Acad Sci U S A. 81, (14), 4275-4279 (1984). Gilmour, D. S., Lis, J. T. In vivo interactions of RNA polymerase II with genes of Drosophila melanogaster. Mol Cell Biol. 5, (8), 2009-2018 (1985). Solomon, M. J., Larsen, P. L., Varshavsky, A. Mapping protein-DNA interactions in vivo with formaldehyde: evidence that histone H4 is retained on a highly transcribed gene. Cell. 53, (6), 937-947 (1988). Ren, B., et al. Genome-wide location and function of DNA binding proteins. Science. 290, (5500), 2306-2309 (2000). Johnson, D., Mortazavi, A., Myers, R., Wold, B. Genome-wide mapping of in vivo protein-DNA interactions. Science. 316, (5830), 1497-1502 (2007). Hellsten, U., et al. The genome of the Western clawed frog Xenopus tropicalis. Science. 328, (5978), 633-636 (2010). Lee, T. I., Johnstone, S. E., Young, R. A. Chromatin immunoprecipitation and microarray-based analysis of protein location. Nature Protocols. 1, (2), 729-748 (2006). Blythe, S. A., Reid, C. D., Kessler, D. S., Klein, P. S. Chromatin immunoprecipitation in early Xenopus laevis embryos. Dev Dyn. 238, (6), 1422-1432 (2009). Gentsch, G. E., Smith, J. C. Investigating physical chromatin associations across the Xenopus genome by chromatin immunoprecipitation. Cold Spring Harb Protoc. 2014, (5), (2014). Ubbels, G. A., Hara, K., Koster, C. H., Kirschner, M. W. Evidence for a functional role of the cytoskeleton in determination of the dorsoventral axis in Xenopus laevis eggs. J Embryol Exp Morphol. 77, 15-37 (1983). Heinz, S., et al. Simple combinations of lineage-determining transcription factors prime cis-regulatory elements required for macrophage and B cell identities. Mol Cell. 38, (4), 576-589 (2010). Robinson, J. T., et al. Integrative genomics viewer. Nat Biotechnol. 29, (1), 24-26 (2011). Thorvaldsdottir, H., Robinson, J. T., Mesirov, J. P. Integrative Genomics Viewer (IGV): high-performance genomics data visualization and exploration. Brief Bioinform. 14, (2), 178-192 (2013). Imoto, S., Nolan, J., Bioinformatics Miyano, S. 20, (9), 1453-1454 (2004). Camacho, C., et al. BLAST+: architecture and applications. BMC Bioinformatics. 10, 421 (2009). Conesa, A., et al. Blast2GO: a universal tool for annotation, visualization and analysis in functional genomics research. Bioinformatics. 21, (18), 3674-3676 (2005). Sive, H., Grainger, R., Harland, R. Early development of Xenopus laevis: A laboratory manual. Cold Spring Harbor Laboratory Press. Cold Spring Harbor, New York. (2000). Chen, Y., et al. Systematic evaluation of factors influencing ChIP-seq fidelity. Nat Methods. 9, (6), 609-614 (2012). Sharov, A. A., Ko, M. S. H. Exhaustive search for over-represented DNA sequence motifs with CisFinder. DNA Res. 16, (5), 261-273 (2009). Bailey, T. L., et al. MEME SUITE: tools for motif discovery and searching. Nucl Acids Res. 37, (2), W202-W208 (2009). Park, P. J. ChIP-seq: advantages and challenges of a maturing technology. Nat Rev Genet. 10, (10), 669-680 (2009). Gentsch, G. E., et al. In vivo T-box transcription factor profiling reveals joint regulation of embryonic neuromesodermal bipotency. Cell Rep. 4, (6), 1185-1196 (2013). Barabasi, A. L., Oltvai, Z. N. Network biology: understanding the cell's functional organization. Nat Rev Genet. 5, (2), 101-113 (2004). Biggin, M. D. Animal transcription networks as highly connected, quantitative continua. Dev Cell. 21, (4), 611-626 (2011). Nieuwkoop, P. D., Faber, J. Normal table of Xenopus laevis (Daudin): a systematical and chronological survey of the development from the fertilized egg till the end of metamorphosis. Garland. New York & London. (1994). Akkers, R. C., et al. A hierarchy of H3K4me3 and H3K27me3 acquisition in spatial gene regulation in Xenopus embryos. Dev Cell. 17, (3), 425-434 (2009). Yoon, S. J., Wills, A. E., Chuong, E., Gupta, R., Baker, J. C. HEB and E2A function as SMAD/FOXH1 cofactors. Genes Dev. 25, (15), 1654-1661 (2011). Jallow, Z., Jacobi, U. G., Weeks, D. L., Dawid, I. B., Veenstra, G. J. Specialized and redundant roles of TBP and a vertebrate-specific TBP paralog in embryonic gene regulation in Xenopus. Proc Natl Acad Sci U S A. 101, (37), 13525 (2004). Buchholz, D. R., Paul, B. D., Shi, Y. -B. Gene-specific changes in promoter occupancy by thyroid hormone receptor during frog metamorphosis. Implications for developmental gene regulation. J Biol Chem. 280, (50), 41222-41228 (2005). Wills, A. E., Guptaa, R., Chuonga, E., Baker, J. C. Chromatin immunoprecipitation and deep sequencing in Xenopus tropicalis and Xenopus laevis. Methods. 66, (3), 410-421 (2014). Metz, B., et al. Identification of formaldehyde-induced modifications in proteins: reactions with model peptides. J Biol Chem. 279, (8), 6235-6243 (2004). Landt, S. G., et al. ChIP-seq guidelines and practices of the ENCODE and modENCODE consortia. Genome Res. 22, (9), 1813-1831 (2012). Mazzoni, E. O., et al. Embryonic stem cell-based mapping of developmental transcriptional programs. Nat Methods. 8, (12), 1056-1058 (2011). Deal, R. B., Henikoff, S. A simple method for gene expression and chromatin profiling of individual cell types within a tissue. Dev Cell. 18, (6), 1030-1040 (2010). Bonn, S., et al. Tissue-specific analysis of chromatin state identifies temporal signatures of enhancer activity during embryonic development. Nat Genet. 44, (2), 148-156 (2012).